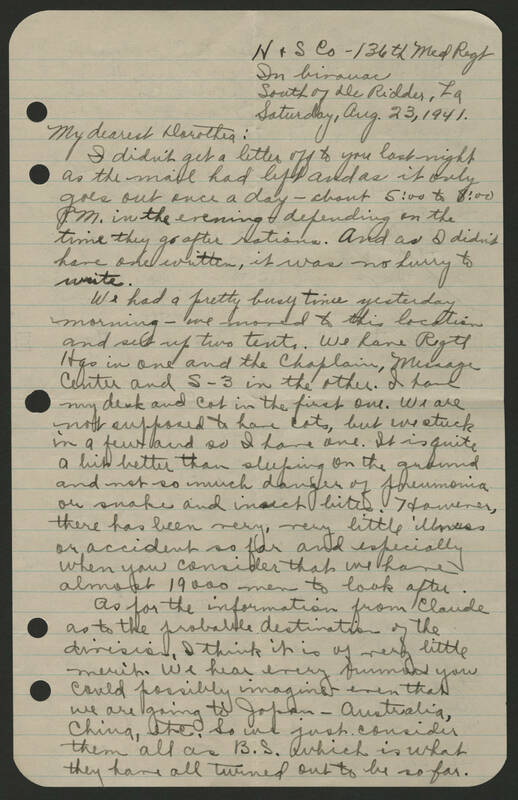 N & S Co- 136th Med Reg In bivouac South of the Ridder, La Saturday, Aug 23, 1941 My dearest Dorothea: I didn't get a letter off to you last night as the mail had left and as it only goes out once a day-about 5:00 to 8:00 PM in the evening- depending on the time they go after rations. And as I didn't have one written, it was no hurry to write. We had a pretty busy time yesterday morning-we moved to this location and set up two tents. We have [illegible] in one and the Chaplain, [illegible] Center and S-3 in the other. I have my desk and cot in the first one. We are not supposed to have cots, but we stuck in a few and so I have one. It is quite a bit better than sleeping on the ground and not so much danger of pneumonia or snakes and insect bites. However, there has been ver, very little illness of accident so far and especially when you consider that we have almost 19000 men to look after. As for the information from Claude as to the probable destination of the division, I think it is of very little merit. We hear every rumor you could possibly imagine even that you could possibly imagine even that we are going to Japan-Australia, China, etc. So we just consider them all as B. S. which is what they have all turned out to be so far.